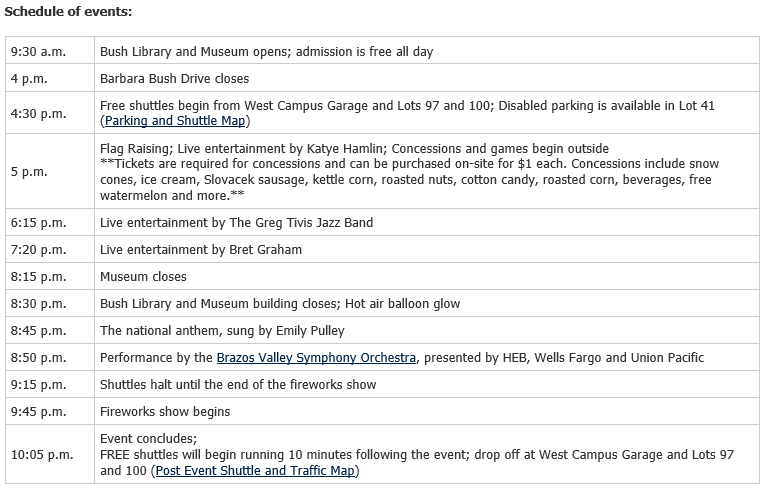 We’ve found all the freedom-celebrating fun events for the Fourth of July in Bryan and College Station! These activities are filled with food, fireworks, music and patriotic fun for the entire family! The College Station Lions Club’s Fourth of July “I Love America” Celebration, will be going on all day at the George Bush Presidential Library Center at A&M. The museum will be open from 9:30 a.m. to 8:15 p.m. with free admission for everyone all day; building closes at 8:30 p.m. Live entertainment, concessions and games for children begin at 5 p.m. The evening will culminate with a spectacular fireworks display and concert by the Brazos Valley Symphony Orchestra. Come early and bring lawn chairs, picnic baskets and blankets, but leave your pets or glass containers at home please. Come early and bring lawn chairs, picnic baskets and blankets, but leave your pets or glass containers at home please. For the past 28 years, the Brazos Heritage Society sponsors an old-fashioned Independence Day in Heritage Park, located at 30th and Hutchins Street in the Eastside Historical District of Bryan. This free event includes a flag-raising ceremony, patriotic readings and music, a children’s parade, games and activities, and refreshments. Spirit Ice Arena & the American Cancer Society are teaming up to give you a COOL way to celebrate the 4th of July from 12 p.m. – 6:30 p.m.! What better way to beat the summer heat than in an ice rink? All pools will operate 12-6 p.m and there will be games every hour, duck derby, noodle races, $1 hot dogs and more at Adamson Lagoon! Washington on the Brazos is located between Brenham and Navasota off State Hwy 105, on FM 1155. • Free country music concert by Josh Ward at the amphitheater from 7-9 p.m.
•“Fireworks on the Brazos” firework show presented by H-E-B begins at 9:15 p.m. The City of Navasota is hosting the annual patriotic City Parade and Independence Daze celebration at the Navasota Center. The July 4th Parade begins at 10:00 a.m. at Prosperity Bank and ends at the Navasota Center on Stadium Drive with the Independence Daze celebration begin at 10:30am. The parade is for people of all ages and invites everyone to bring their bikes, wagons, roller skates, skate boards, pets and more. Free carnival games, joy jump, free food and drinks, music, games and more will be located at the Navasota Center afterwards! The Navasota Swimming Pool will also be open and admission is free July 4th from 10:30 a.m.- 2:00 p.m. More info: https://www.facebook.com/navasotatx/posts/10152497893177718.